Canada, Italy, Norway, Russia, the United Kingdom and the Bill & Melinda Gates Foundation committed US$1.5 billion to launch the first Advance Market Commitment (AMC) to help speed the development and availability of a new vaccine which is expected to save the lives of 5.4 million children by 2030. The AMC pilot represents the first step in a historic effort to create a market for life-saving vaccines for children in the world's poorest countries. The new initiative will target pneumococcal disease, a major cause of pneumonia and meningitis that kills 1.6 million people every year. The pilot will provide 7 to 10 years of funding to support the development of future vaccines against pneumococcal disease and will include provisions to assure the long term sustainable supply and price for the poorest countries. 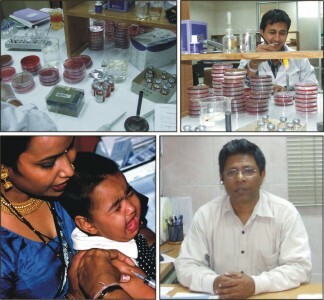 Dr Samir K Saha, Professor of Microbiology at the Bangladesh Institute of Child Heath (Dhaka Shishu Hospital), who runs a PneumoADIP-supported disease surveillance project in Bangladesh and the country spokesperson of GAVI's PneumoADIP recently shares different issues of pneumococcal vaccine with The Daily Star. The introduction of new vaccines into developing countries can only be accelerated by ensuring an affordable, sustainable supply. To meet this challenge, the global supply capacity must exceed the demands of high and middle income countries. Low income countries have the largest demand for vaccine doses on a global basis, but represent the smallest potential market in revenue because of the need for a much lower price per dose. These are challenging problems, but PneumoADIP's supply analyses and forecasting can help overcome the obstacles to achieving affordable, sustainable supply. PneumoADIP conducted a global market assessment to develop a firm economic basis for engaging industry, donors and countries. By developing a global assessment tool to calculate the potential vaccine demand in every country in the world in both the private and public sectors, PneumoADIP demonstrated that a potential billion dollar market exists for pneumococcal vaccines in low income countries. Without this robust global analysis, industry may continue to overlook the low income countries in favor of high and middle income markets. Multi-national and emerging suppliers are beginning to recognize the potential of the pneumococcal vaccine market in low income countries. Streptococcus pneumoniae is a serious, common, and preventable global health problem. World Health Organisation (WHO) estimates that pneumococcal diseases, mainly pneumonia and meningitis, kill more than 1.6 million people annually. This includes up to 1 million childhood deaths, making pneumococcal disease the number one vaccine-preventable cause of childhood death worldwide. In the US, the benefits of childhood pneumococcal vaccination have exceeded everyone’s expectations. The next challenge is to speed this life-saving vaccine to children everywhere. Each year 80,000 children die of pneumonia and disease associated with pneumococcus bacteria like meningitis and 102,060 people dies of pneumonia each year. These huge number of deaths are vaccine preventable. And still there are many deaths associated with these diseases those are not documented. Vaccine is first marketed and available in the developed countries who develop it. After a long period of time, it is introduced in the developing countries when the cost of the vaccine gets down by selling in huge amount in the market of developed world. But the question is — who need the vaccine most? The developing countries need the vaccine most since the disease is most prevalent there. But it is a matter of regret that the vaccines reach these wretched people at long time. Meanwhile, the toll of the disease takes millions of people. To prevent these huge number of deaths we need to introduce the vaccine now. The vaccine is already in the market of developed countries at a rate that the developing countries cannot afford. The US has prevented about 9800 cases of pneumonia. With about 80% serotype coverage, it exceeded everyone’s expectations there. Dr Saha showed that if we could introduce the vaccine now, we could prevent so far the death of 9797-17140 people among 30618 deaths due to pneumonia. We just need provide the data showing the disease prevalence in our country to the global alliance to draw their attention. In this regard, the surveillance is going on in the country in different research centers. Dr Samir K Saha is heading the surveillance in Bangladesh. There are many ways to collect the three types of data about pneumococcal disease; however, in order for the data to be most useful for both scientists and policy makers anywhere, the data must be collected in the same way or a comparable way. Pneumococcal disease (as all diseases) occur everywhere and are not limited by any borders. As long as data are comparable across borders, estimating disease burden for areas without surveillance is possible. The data can focus on emphasising the importance of preventing unnecessary child deaths. A key to the success of global health programmes is the ability to generate, effectively use and clearly communicate the vital information. Dr Saha told that the government should come forward to inform the global alliance that how dire the need of the pneumococcal vaccine is in Bangladesh like other developing countries and how beneficial its outcome. The introduction of new vaccines in developing countries has in the past been delayed due to a lack of incentives and adequate planning to address both supply and demand issues before launching vaccines. A vicious cycle existed, wherein uncertain demand led to limited supply, which in turn kept prices relatively high and further increased the uncertainty of demand. Over the last year, PneumoADIP has worked with a variety of stakeholders to develop and test an innovative demand forecasting model to help break this cycle. The demand forecasting model developed by PneumoADIP is unique in its emphasis on consensus-building and sustainability. It brings together countries, donors, and manufacturers in an interactive model designed to underpin the accelerated development and introduction of pneumococcal conjugate vaccine in developing countries. Current evidence points to an effective pneumococcal vaccine that could begin to save lives now. We cannot afford to wait until another million children die next year. We must act now.